This topic contains 1 reply, has 2 voices, and was last updated by charlie 1 week, 2 days ago. Hello I’m new to this group. My Dad has a 1936 Rotovator machine made by GEOMONRO Ltd. He has the manual for it and is wondering if anyone knows any information regarding it’s worth ? 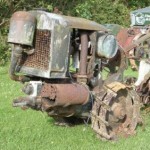 Geo Monro did not start manufacture of Rototiller until 1948 with the model 56. Prior to this date they were importers and agents for the Swiss made Rototiller models 5, 30,50 etc. Picard and Pictet were importers up to 1930. Estimates of value are very difficult as so many factors can affect what someone is willing to pay eg model, condition, location etc. If you look on e bay it will give some idea of prices they fetch. It is not clear which model you have as 30 and 50 are very different machines, could you please add a photo to enable identification of model.